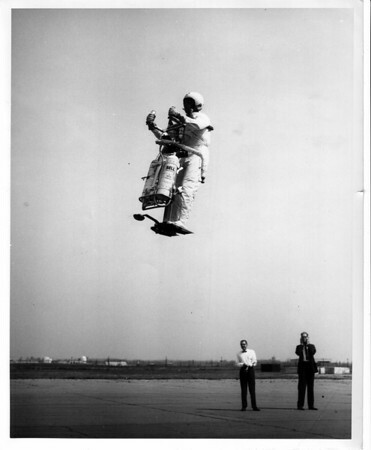 Bell Rocket Belt - Robert F. Courter, of Textron's Bell Aerosystems Company, pilots the first manned free flight of the company's fixed-thruster, Body- Controlled Pogo Gehicle, a configuration being evaluated for future lunar flying vehicle requirements. On the ground are from left, Wendell F. Moore inventor of the original Bell Pogo family of individual propulsion systems, and Kennneth L. Levin, head of the company's Lunar Systems program. Bell photo # 300021 ... no date.